A shop and bright restaurant all about fresh, local seafood. : Half fish market and half seafood restaurant, Greenpoint Fish & Lobster Co. is a celebration of all delicacies from the sea. Light streams into the small tile-filled dining room, with just two tables and a long marble bar. There’s a lobster tank and a raw bar piled high with oysters, littleneck clams, live sea scallops and sea urchin. Diners can watch the Greenpoint Fish & Lobster Co. team shuck and prep at the speed of light. The owners value sustainability and know where every sea creature comes from --- just ask. 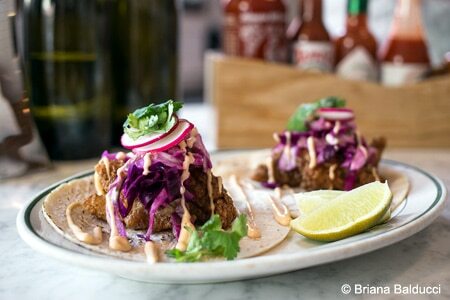 Baja fish tacos are overfilled with crispy local market fish, crunchy cabbage and chipotle mayo. It’s a tough contest between them and the Maine-style lobster rolls, sweet with fresh hand-picked lobster meat, just enough mayo, Maldon sea salt and tarragon. Craft beers and wine are for offer on tap. Key lime pie is a tart, tangy and satisfying way to end a meal. On your way home, pick up a whole sea bass or a dozen oysters if your seafood itch hasn’t yet been scratched.